The best way to improve at anything — whether that’s running a business or making a cup of coffee — is to figure out piece by piece what’s working while letting go of what isn’t. When it comes to a cup of coffee, it’s a relatively simple process. But when it comes to running a company or team, things get more complex. With a million projects, tasks, and processes running simultaneously, identifying which pieces are working and phasing out those that aren’t is decidedly more difficult. This is where data flow diagrams come in. A data flow diagram (or DPD for short) shows how processes flow through a system. It also gives you information about things such as the inputs and outputs (where things come from, which route they go through, and where they end up), and the process itself. This includes data stores and the various subprocesses the data moves through. Unlike a flow chart, there are no decision points. And unlike a network diagram, there are no loops. Simply put, they’re a visual way to show a process or system, which, in turn, can help you work out where there are issues and inefficiencies. Data flows can feel intimidating: where do you start? And which approach is right for you? Fear not: if you’re a data flow newbie, then you’ve come to the right place. There are two types of data flow diagrams to choose from depending on what you want to examine in your flow. Logical data flow diagrams show what happens during an information flow. They tell you what information is being generated, where it’s going, and where it ends up. The processes are business activities, meaning they’re non-technical (and that means anyone should be able to understand them). Physical data flow diagrams show how information moves through a system. This means detailing specific software and programs as well as people. 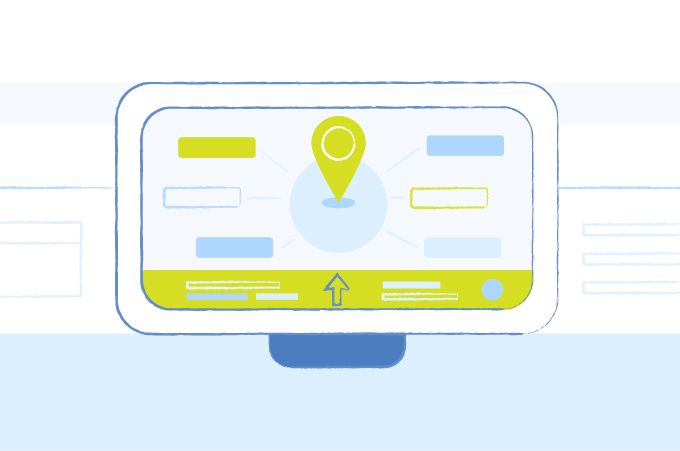 For example, one could show you how an order gets placed by a customer online and goes through your business’s software to place and fulfill the order. These are generally technical, but not always. You can create both types to describe the same information flow, but each would tell you a different side of the story and provide different activities to be optimized. They can be used separately or — often more powerfully — in conjunction. There are two main methodologies of notation used in DFDs: Gane & Sarson vs. Yourdon & Coad. 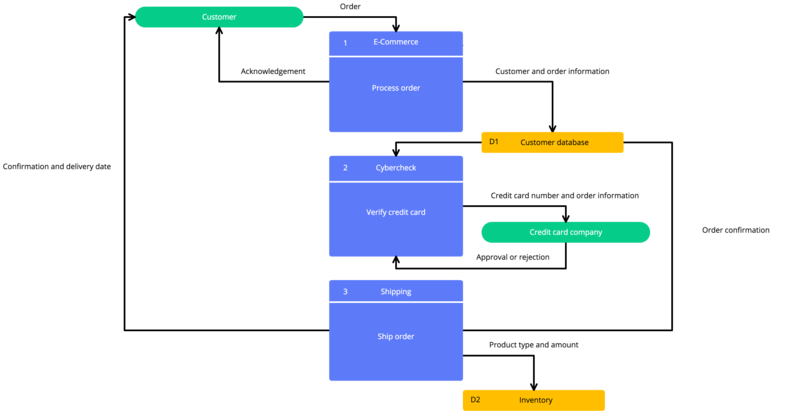 They differ slightly, but both use shapes and symbols to represent the four main elements of a DFD: external entity, process, data store, and data flow. External entity: This is an outside system that’s either a data source or destination. You’ll usually find them at around the edges of a DFD. Process: This is something that affects the data and its flow by changing it by sorting it or changing its flow of direction. Processes sit between the input and the output, and there can be several of them in a single diagram. Data store: Data stores hold information until later use. Inputs can flow through a process and into a data store, and then back out the data store and through a process. Data flow: Data flow marks your information’s path through the various processes and data stores. DFDs are categorized in terms of levels, where level 0 is the simplest, and level 2+ is the most complex. Level 0 DFDs also go by the name of context diagrams. This is the most pared back form, and it shows only a single process and its external influences. This is still considered very top level, but it offers more detail than a level 0 DFD. It will consist of a single process, which is then broken down into sub-processes. These, in turn, will be linked by different processes and data stores. DFDs can potentially go to level 3 and further, but level 2 is usually enough. As with level 1, level 2 is simply a step up in complexity again. This means more granular subprocesses, more data stores, and more flows. Now that you know the ‘what’ and ‘why,’ it’s time to address the ‘how.’ Creating a data flow diagram consists of four key stages. Sort your inputs from your outputs. Each process should have an input and an output. Remember this, and you won’t end up with any loose ends. Start at Level 0. So this means creating a simple context diagram with one single process. Now it’s time to add meat to the bones. You want to take your diagram from a level 0 to a level 1 by adding more processes, data stores, and data flows. But don’t run before you can walk — add items gradually and carefully, bearing in mind each data flow’s source and destination, as well as the stages it needs to go through to get there. You can probably guess what’s next! Repeat step 3 until your diagram has reached level 2+. Remember to take a step back every now and again to review your progress. Does it all make sense? Is every flow, store, input, and output included and accounted for? Run it past a colleague for extra reassurance: if an outsider can understand it, then you’re onto a winner. Is there a simpler way to achieve the same goals? Are there requirements that should be known earlier in the process? Analyzing each process and subprocess within the context of the entire flow will help you discover areas you can improve. Once you’ve identified those areas, design a new data flow diagram based on your findings and implement your new flow. Through each step, remember: data flow diagrams should always save you time. You don’t want to spend half the day grappling with weird MS Word clip art arrows and boxes when you could just select a crisp template and edit it in minutes. So before you begin, make sure you have some kind of diagramming software or a template at the ready. It’ll save you time and give your finished diagram a more professional, polished look. And if you use a cloud-based tool, such as Cacoo, you can share and update your handiwork with your entire team, stakeholders, and clients in real-time, improving transparency and communication along the way.